LalitA sahasranAma is one of the popular hymns in Hinduism. "Karanguli nakhotpanna narayana dashakrutih Mahapashu patastragni nirdagdhasura sainika"
Does it mean that the 10 incarnations of Vishnu have come from the fingernails of Sri lalitA or there are any other meanings of this verse? In my another answer I have shared similar idea of Trimurtis and 10 incarnations emerged from the goddess. "Nails", joints of the nails or fingertips. Ten forms of Narayana are the ten incarnations of Vishnu, viz., Fish, Tortoise, Boar, Man-Lion, Dwarf, Parashurama, Rama, Balarama, Krishna, Kalki.... Or, "Ten forms": the word in the text is Dashakritih, which may also be taken to mean the five states of Jiva and the five functions of Ishvara. In the worldview of the Shaiva and Shakta Agamas, the Jiva is said to have five states, namely waking, dreaming, deep sleep, Turiya, and Turiyatita. And Ishwara is said to perform five functions, namely creation, preservation, destruction, obscuration, and liberation. So Bhaskararaya is suggesting that these may be the ten forms being referred to. This is mentioned in the Brahmanda Purana. It is related to the Bhandasura episode when the world was facing a Pralaya like situation. Goddess then have to be invoked from Chidagni Homa Kunda. H. At the end of this great fire sacrifice, all of you (the performers of the Yaga) should jump in to the Homa Kunda (fire pit). While doing so, you must possess absolute devotion. K. She will create Parabrahma in the name of Kameshwara and will have Him as Her consort. L. This couple will re-create the entire universe, which will turn out to be more beautiful than the previous creation. M. Lalita Parameshwari will bring Manmatha back to life. This above passage provides the background. The next portion of the story is found here. It describes the secondary creation of Goddess Lalita. She extended Herself in both male and female forms and continued the process of creation. A. From the left eye, which was of the nature of Soma (moon) came Brahmaand Lakshmi Devi. B. From the right eye, which was of the nature of Soorya (sun) came Vishnu and Parvati. C. From the third eye, which was of the nature of Agni (fire), came Rudra and Sarasvati. D. Lakshmi & Vishnu, Shiva & Parvati and Brahma & Sarasvati became couples. She herself continued to create certain things. (iii) From the pendent hanging in front of her forehead came the stars. Not the answer you're looking for? Browse other questions tagged mythology vishnu shaktism lalita . What are the 10 Vishnu incarnations of Devi Lalitha? What happened to Vishnu's incarnation Narayana after his Pancharatra Yagna? What is the story of Vikhanasa, founder of the Vaikhanasa school? 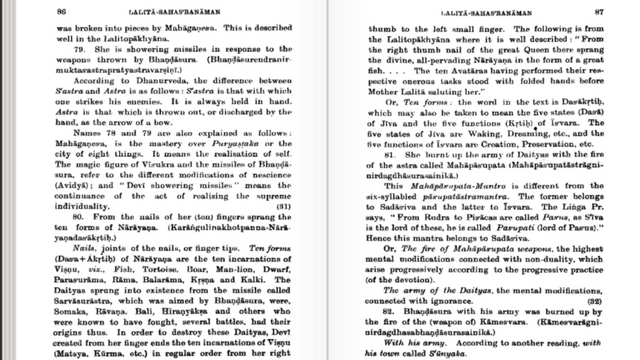 What is the earliest reference to the Asura Mahabali? Who is Narayana among the Sadhyas?